When the bacon is done, transfer it to a paper towel to drain; pour the bacon fat into a small bowl, it should measure out to be about three tablespoons. Remove the potatoes from the oven and allow them to rest until they're cool enough to handle, about 10 minutes. Halve, then quarter the potatoes and place them in a large mixing bowl. To make the dressing, whisk together the bacon fat, red wine vinegar, whole grain mustard and pinch of salt. Pour the warm dressing over the potatoes and toss until coated. Next, add red onion, diced bacon, flat-leaf Italian parsley and dill and give it a light toss. Taste the potato salad and adjust the seasonings, if you like, adding more dill, more mustard or more vinegar. 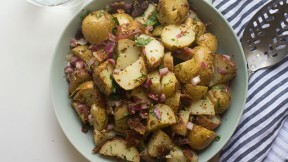 Serve this potato salad warm or room temperature.